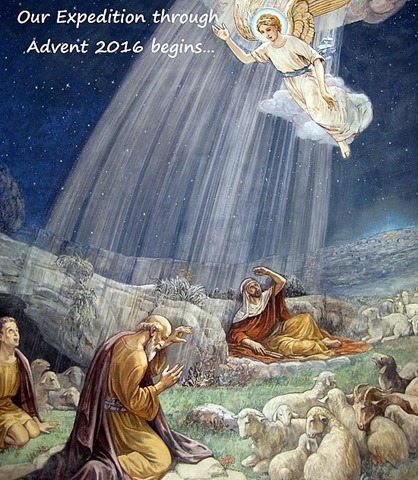 The season of Advent 2016 is upon us. So we begin our annual expedition/exploration to Bethlehem, the birthplace of Jesus. I use the words expedition/exploration because they both lend themselves to a more deeper meaning to our annual pilgrimage to the manger. The first time I experienced the Great Smoky Mountains was back in the 1967 from an airplane flying home while on leave from the USS Newman K Perry. But then in 1997 as we drove I-75 to the Great Smoky Mountains it was a totally different experience. One experience lasted minutes, the other years, each time we make our spiritual pilgrimage to the manger our experience must not be momentarily but lasting. The question that continues to haunt me and intensifies at this time of the year is why do I really need to experience Jesus as a helpless newborn. And each year the Holy Spirit reminds me of. ”…Jesus said, “Truly, I say to you, unless you turn and become like children, you will never enter the kingdom of heaven.” (Matthew 18:3, ESV, emphasis mine) For us returning to the manger represents life coming full circle. We spend most of our life learning to be independent but then comes a point when independence becomes problematic. When I watch our great grandson Colton I am amazed at how both fragile and agile. To be both fragile and agile at the same time is a sign of being dependent and independent at the same time. Colton at the age of 3 isn’t the only one who is fragile and agile at the same time, I am, you are. With us adults the dividing line between the two of them swings one way then the other. For Colton the line swings into the dependency yet slowly moving toward independency for me the line is moving slowly (and with some personal struggles) from independency toward dependency. As we begin our Expedition through Advent 2016 remember it is just as important that we learn about ourselves (maybe more so with some) as it is to learn about Jesus as a baby. Yes , our grandson is 20 months old and at 62 I feel the creaks, and twinges every day but it is such a joy to see him bounce around with never ending(or so it seems) energy and it will. Are Christmas special this year because he and his family will be with us and to see Christmas through the eyes of a child again will be really special – Thank you for all your encouraging words.